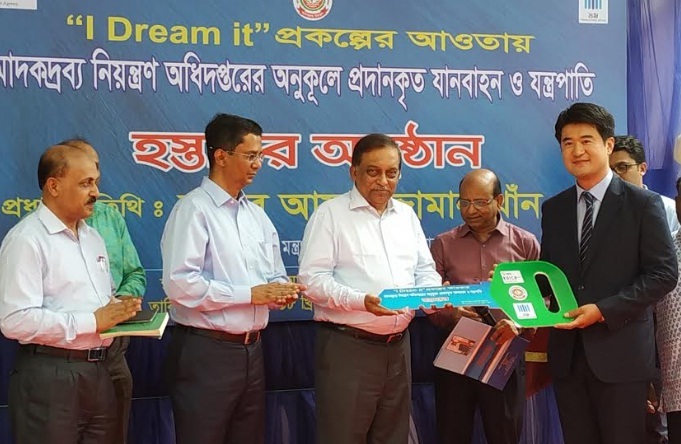 Korea International Cooperation Agency (KOICA) on Monday handed over vehicles and equipment to Bangladesh to support eradicating illicit drugs in Bangladesh under its “I DREAM it” project. Home Minister Asaduzzaman Khan was present at the handing over ceremony held in the city. Joe Hyun-Gue, Country Director, KOICA Bangladesh Office handed over the equipment and keys of vehicles. The Home Minister expressed his gratitude to the KOICA for its kind support to control narcotics in Bangladesh. He hoped that this project along with Bangladesh government’s anti-narcotic action plan will help build drug free society. KOICA, in collaboration with Department of Narcotics Control (DNC), is implementing the project with a budget of US$4 million in grant aid for three years to achieving SDG target 3.5, namely strengthen the prevention and treatment of substance abuse, including narcotic drug abuse. Under this project, current business processes of DNC will be analysed as well as reengineered with a development of narcotic-related information management system, KOICA said. The project is also supporting to upgrade two DNC laboratories in Dhaka and Chittagong and providing with new IT system, drug investigation and drug testing and identification related equipment, it said. In addition, there will be short-term and medium-term capacity building programme for Bangladeshi relevant officials in Korea for advanced drug management and investigation techniques in order to preventing narcotic-proliferation in Bangladesh. KOICA said the project will make narcotic prevention videos with media and organize campaigns to raise public awareness about the harmful effects of narcotics.